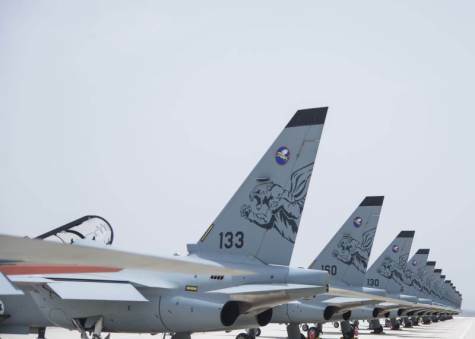 Last week (Thursday), the 102nd “Flying Tiger” Squadron celebrated 50 years. The 102nd Squadron is Hatzerim AFB’s first squadron, and has a glorious legacy of multi-theatre activity in face of various threats. In 2014, the squadron integrated “Lavi” (M-346) aircraft, and turned from being a fighter squadron to the first training squadron with the goal of instructing the IAF’s fighter division pilots. “For 50 years, the squadron has been operationally active while training aircrew combatants”, stated IAF Commander Maj. Gen. Amikam Norkin in the squadron’s 50-year celebration ceremony. “Throughout dozens of years, the squadron trained the IAF’s fighter pilots alongside performing operational activity, and in doing so created the IAF’s high-quality service members. Today, when the “Lavi” aircraft leads pilots and WSOs in fifth generation fighter training, I wish the squadron that they keep their spirit while expanding the capabilities of aircrew members”. To celebrate 50 years of heritage and 4 years of comprehensive training, the IAF Site gives an insight on the IAF’s biggest instruction project – the “Lavi” Project. What is a Fighter Pilot? “Three years ago, we carefully approached integrating ‘Lavi’ aircraft while decommissioning ‘Ayit’ (A-4) aircraft”, stated Brig. Gen. Avshalom Amosi, Hatzerim AFB commander. “We have traveled to new, far and advanced places. Now, as the ‘Lavi’ aircraft decorates the sky, and “Lavi” graduates are operationally qualified in their squadrons, I can appreciate the work of the squadron's service members and its impact on the entire IAF. I can appreciate the great contribution made through the squadron’s heritage towards young pilots and WSOs - for them it is a pinnacle”. The "Lavi", made by the Italian "Leonardo" aerospace company, is an advanced trainer aircraft which replaced the IAF's "Ayit" and "Netz" (F-16A/B). The Italian aircraft is utilized in the Fighter Department of the Flight Course, in the stage between the cadets' graduation and the beginning of their service in the operational squadrons, in the Operational Training Course and the 102nd Squadron's operational training stage. "Our vision was an innovative squadron", said Maj. A', Deputy Commander at the 102nd Squadron and a member of the "Lavi" aircraft's integration team. "First, we laid out our grasp of the necessary instructional process for fighter pilots. We defined the fighter pilot's role, the necessary characteristics and where we want them to be two years after they graduate from their Flight Course. We learned when we should introduce them to advanced systems, which systems we should integrate; we learned which scenarios focused on flight elements and which scenarios were operational. The instruction was no longer based on their commanders but on a prewritten doctrine". "During their operational training, the pilots who graduated from their Operational Training Course partner up with the WSOs (Weapon Systems Officer) who finished their flight course. They fly together, plan together and learn together", added Lt. Col. A'. "That is how we train the cadets to become aircrew members in their operational squadrons and form a new kind of connection between pilots and WSOs. Until now, the WSOs arrived at their squadron as soon as they graduated from their Flight Course. As a result, it took a long time to bring them up to speed with the pilots, who underwent a year of advanced training after their course. Today, living together, studying together and flying together leads to a quantum leap in performance". After four years, the squadron has finally begun stabilizing. Soon, the first Flight Course graduates who trained in the "Lavi" will arrive at their operational squadrons. The squadron's service members have begun thinking ahead with the hopes of seeing how far the IAF's advanced trainer aircraft can go. "The 'Lavi' enabled one of the IAF's most advanced virtual training simulations. The aircraft has no missiles or electronic warfare systems – in turn, they are simulated by virtual systems connected to the various aircraft which transfer the data to the cockpit, which then presents them as actual systems", elaborated Lt. Col. A'. "We can simulate 'Mig-29' aircraft which lock onto the real aircraft and fire virtual missiles at them. This allows us to perform complex scenarios in safe conditions". "We are about to integrate a real-time management system which will allow the coordinator of any given exercise to respond to the aircraft's operations in the air. We can organize exercises that aren't planned in advance, and the cadets who aren't currently training can watch in real-time. Another major improvement is the LVC (Live Virtual Construct), which will allow cadets training in the simulator to join pilots in the air. This way, a four-aircraft formation in the air will be able to train against simulated aircraft. In any usual squadron, this would be only be possible in a large exercise, but here, it's possible anytime".